Advanced Russian fighters found in the sand in Iraq-Truth! - Truth or Fiction? Advanced Russian fighters found in the sand in Iraq-Truth! 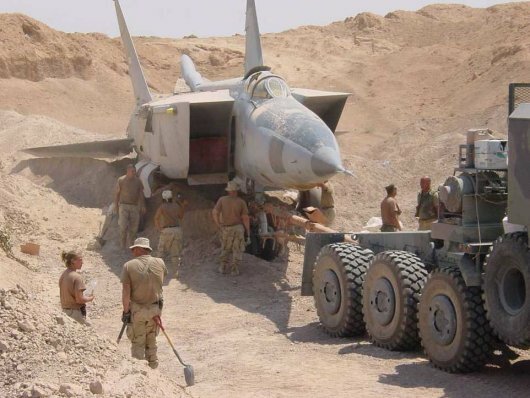 Advanced Russian Fighter Found in the Sand in Iraq-Truth! & Fiction! 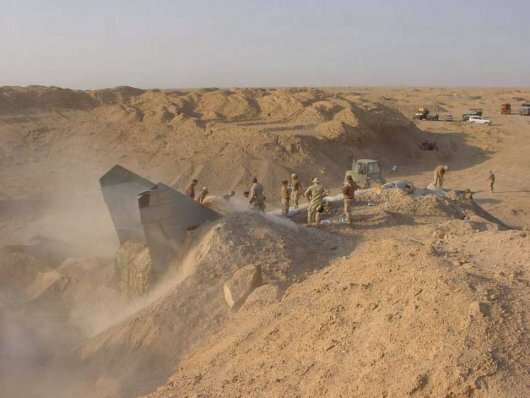 Several Iraqi fighter jets are said to have been found buried in the desert in Iraq including a Russian MiG-25 “Foxbat.” The eRumor says the find was significant to the U.S. because of the sophisticated systems aboard the planes. Canadian journalist Terry Reith has looked into this story into detail. He said that although it is true that the jet fighter was found, some of the information included in the eRumor is inaccurate. Reith found that the pictures in this forwarded email were taken on July 6, 2003, by Sgt. Master T. Collins of the United States Air Force. The airplane in the pictures is a Mig 25, nicknamed The Foxbat. Reith said that it is one of two dozen that were sent to Iraq in 1979 by the Soviets. The Mig 25 did not perform well, however, in either the Iran-Iraq war or the gulf war in 1991. It was no match for British and U.S. in the Gulf War planes so Sadaam Hussein did not use the planes very much after two of them were quickly shot down. Reith said that by the time U.S. and coalition troops invaded Iraq in 2003 the jets were not in action. They had been hidden by burying them in desert sand. Contrary to the claims of the forwarded email, these were not “buried treasure” equipped with “sophisticated electronic warfare devices.” Reith reported that they were remnants of the cold war and more than 30-years old. In other words, nothing that had not been seen by the U.S. before. Contrary to what some in the major media have reported, not all the jets found were from the Gulf War era. The Foxbat is known to be one of Iraq’s top jet fighters. The advanced electronic reconnaissance version found by the U.S. Air Force is currently in service with the Russian air force. The MiG is capable of flying at speeds of over 2,000 miles an hour, or three times the speed of sound, and at altitudes of over 75,000 feet. U.N. ban on arms sales to Baghdad. The discovery of the buried Iraqi jet fighters illustrates the problem faced by U.S. inspection teams searching Iraq for weapons of mass destruction. Iraq is larger in size than California, and the massive deserts south and west of Baghdad were used by Saddam Hussein to hide weapons during the first Gulf war. Top U.S. weapons inspector Dr. David Kay is known to favor human intelligence as the primary means to find Iraq’s hidden treasure trove of weapons and secrets. Some critics of the Bush administration have claimed that the inability of U.S. forces to uncover weapons of mass destruction is proof that the president misled the nation into the war with Iraq. However, in recent days the critics have fallen silent as word quietly leaked from Iraq that major discoveries have already been made and are now being documented completely. Bush administration officials are keeping any such discoveries secret for the moment.